£3.50 will be added for delivery outside the UK. £5.00 for a pair. Supplied rolled in a tube. A2 poster with striking photograph and information about the baby milk issue. 59 cm by 42 cm. Note: There is a minimum order amount so this item must be ordered with others due to its low price. £1.00 will be added for delivery outside the UK. 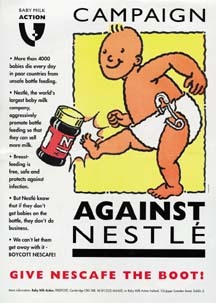 Campaign against Nestlé poster with basic information on the campaign. 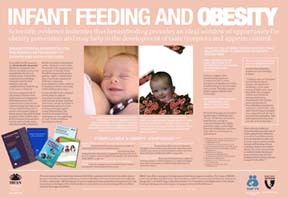 Poster with key facts about infant feeding and obesity and the importance of protecting a mother's right to receive independent information. A3 poster (42 cm by 30 cm). Supplied rolled in a tube.